Is Video Game Rental a Thing of the Past? Online delivery services and console add-ons gain popularity, threatening retailers who’ve come to depend on video game rentals for revenue. Of course, GameStop isn't the only company that stands to lose. Redbox parent Outerwall (NASDAQ:OUTR) has seen its shares soar not because of better results, but because of a massive stock buyback and the impact of last year's acquisition of e-recycling specialist ecoATM. Management never once referred to its video game mix in the follow-up conference call. Seem strange? It would, if Redbox offered more than 40 games for rent across all platforms. By contrast, privately held GameFly offers more than 2,500 titles for rent on digital alone and more than 8,000 by mail. What Netflix is to movies and TV, GameFly is to video games. Yet GameFly has been around going on 12 years. 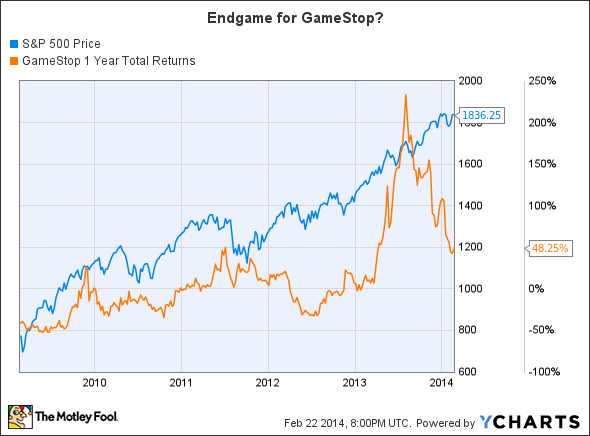 Why the sudden acceleration in the demise of retail video game rental? According to Geek Legacy Executive Editor Justin Cavender, enhanced subscription services from Microsoft (NASDAQ:MSFT) and Sony (NYSE:SNE) may be playing a role with free games delivered digitally. "Sony has PlayStation Plus while Microsoft has Games with Gold. The idea here is that, each month, they offer free games for their subscribers, which are free to keep and play so long as you have an active subscription," Cavender says. Microsoft gamers pay as little as $5 per month for Xbox Live Gold, which includes new titles distributed twice monthly. Sony charges either $9.99 for a single-month membership, $17.99 for three months, or $49.99 for a full year -- on par with Microsoft's lowest rate. Of the two services, Cavender says PlayStation Plus offers the better deal because it includes games for PS3, PS4, and PS Vita: "Theoretically you can have three different systems and never buy games because you get six of them a month. I mean, what more do you need?" Plugging into the PlayStation Plus service gives players access to as many as six games per month. Source: Sony Entertainment. Fair point. So does this mean we nearing the end for GameStop? Cavender isn't optimistic, saying that "in the traditional sense, game rentals are a thing of the past." I'm inclined to agree, even if Wall Street analysts are forecasting 14.5% annualized profit growth over the next five years. Who's going to pay for those gains when Sony has at least 150 million users for its PlayStation Network, a portion of which are Plus members? Microsoft has at least 48 million Xbox Live members. And Valve, the company behind the Steam platform for playing popular games primarily on PC, Mac, and Linux computers, now boasts 65 million members. Add it up, and there's every reason to believe GameStop is out of power-ups and nearing its last life. "It's a brave new world and I am so grateful to be a part of it," Cavender says. Given the millions signing up for digital distribution, I suspect he isn't alone. Now it's your turn to weigh in. What's your take on the video game rental business? Leave a comment in the box below to let us know where you stand, and whether you would buy, sell, or short GameStop stock at current prices.